The system of rank for U.S. Army officers used in World War II is the same as that used in modern times. The first ranks to be defined were those of Brigadier General (one silver star) and Major General (two silver stars) in 1780. The rank of Lt. General (three silver stars) was established in 1798. The rank of Colonel (an eagle) was established in 1832. In 1836 the ranks of Major (gold leaf), Lt. Colonel (silver leaf), Captain (two silver bars) and First Lieutenant (one silver bar) were established. The rank of General (four silver stars) was established in 1866. The rank of Second Lieutenant (one gold bar) was established in 1917. 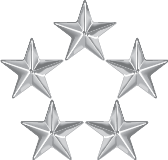 The rank of General of the Army (five silver stars) was established in 1944, and could only be held by four officers at any time. Along with the five stars, the rank of General of the Army was accompanied by the Coat of Arms of the United States.